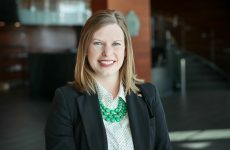 Tera Buckley, assistant director of Marketing & Creative Services at UND, said a slight hiccup in migrating UND’s revamped website means the timeline to see a souped-up, responsive site – a major item in UND’s Strategic Plan Goal Three aim of enrolling and retaining students – will be adjusted from the end of April to May 21. The date was chosen to avoid disrupting the wrapup of the spring semester. Photo by Jackie Lorentz/UND Today. After months of planning, data gathering, design and coding, UND Marketing & Creative Services is weeks away from unveiling its first wave of major updates to UND.edu. But the web team isn’t ready to hand over the front door keys quite yet. 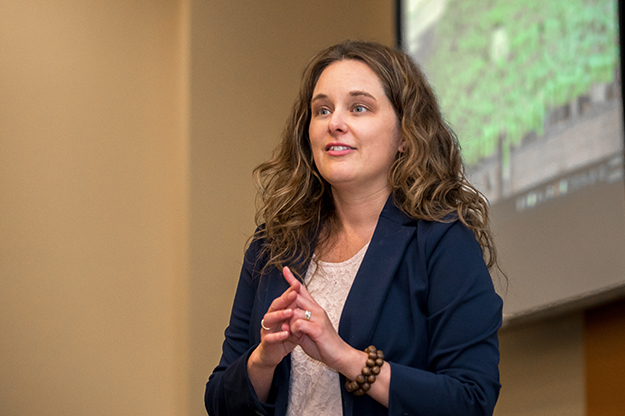 “If you’ve heard me talk about the website project, I use a moving analogy,” Assistant Director Tera Buckley told the March 22 Provost Forum audience. “Everyone’s going to pack their boxes and label their boxes, and then the moving truck is going to show up at a designated time to grab those boxes and move them to the new house. The hiccup in migrating the website means the timeline to see the brand new, responsive site – a major item in UND’s Strategic Plan Goal Three aim of enrolling and retaining students – will be adjusted from the end of April to May 21. The date was chosen to avoid disrupting the wrapup of the spring semester. Buckley wasn’t just bringing the bad news. She came bearing the gift of a preview of the first wave of content that will launch in later this spring. “The part you’ve all been waiting for – tadah!” she exclaimed, gesturing to the bright, modern and clean website projected behind her. The May unveiling will include a new homepage, all new landing pages, a new academic program finder (including 240 unique program pages), a more functional search appliance and completely new navigation. The site’s new “Explore Programs” database-driver interface allows prospective students to browse all of UND’s academic program offerings in one location without having to know what school, college or department it resides in, or even the exact name of the program. 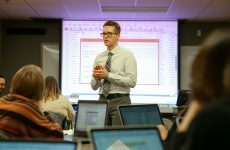 Buckley gave the example of journalism – UND doesn’t offer a journalism program, but programs offered by the School of Communication and Department of English would spring to the page. 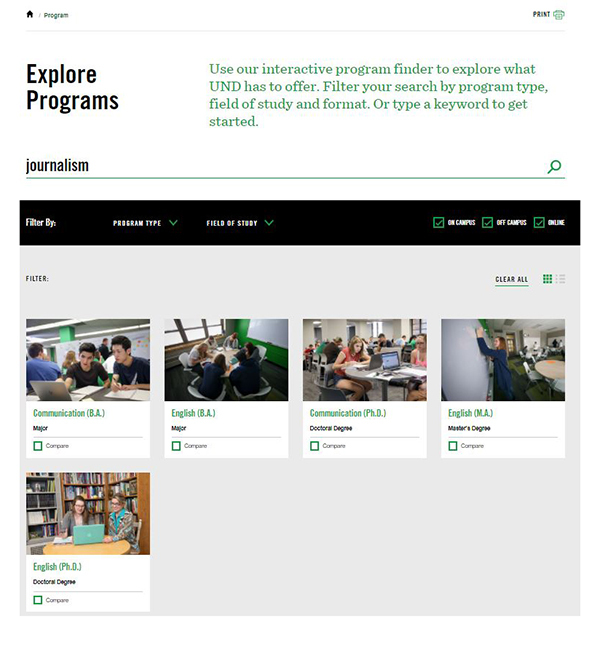 A screen capture shows the new “Explore Programs” interface of the soon-to-be-launched UND.edu redesign. Image courtesy of UND Marketing & Creative Services. Once a program is clicked, the site offers a program snapshot with fresh photography, costs and aid, a “request more information” form and other highlights. Buckley says her team has been working with department chairs to create solid statements of differentiation to show students and families what sets UND’s programs apart. Among other notable changes to the site is the removal of the A-Z index and My UND link currently at the top of all UND webpages. The new highly intuitive search tool will eliminate the need for those options, and navigation will instead be broken into admitted students, current students and faculty/staff. Buckley told the crowd they can expect to see a draft site rolled out internally before the May 21 launch date, and urged people to play around with it on different devices to help find any bugs or issues. Be sure to follow the website redesign blog for the latest updates. Shari Neslon, assessment and systems administrator for UND Student Academic Services, says use of Starfish, a new student success system used to track students’ paths toward graduation, has been growing since April 2014, and has exponentially gained momentum with the launch of the University’s One UND Strategic Plan. Photo by Jackie Lorentz/UND Today. 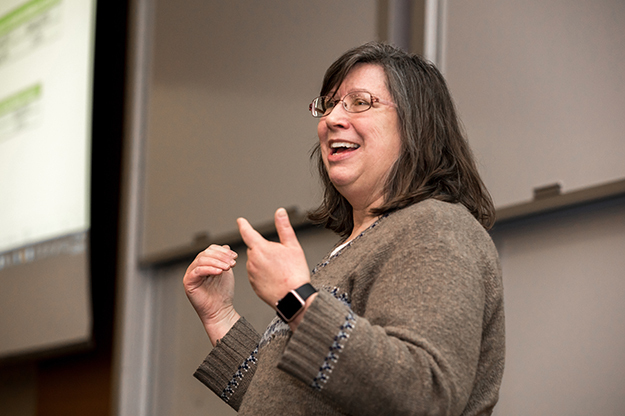 A website refresh will recruit students, but it’s a part of Shari Nelson’s job to keep them here – and it was her turn to explain how an online platform called Starfish is helping. As assessment and systems administrator for Student Academic Services, Nelson holds a lead role guiding the first action item of Strategic Plan Goal Two (increasing retention and graduation rates) – to execute a plan for full use of Starfish advising functionality by faculty, advisors and students by 2022. 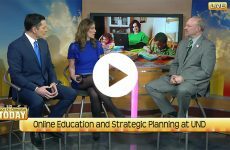 Nelson explained that the robust features of the student success system have been slowly rolling out since April 2014, and have exponentially gained momentum and buy-in with the launch of the Strategic Plan. UND data indicates that at least 68 percent of faculty are already completing midterm survey reports through Starfish, with an aim of a 70 percent completion rate by this fall. “We only need to grow 2 percent to reach that, and I’m confident that with some of the things we have in place that we will reach our goal,” Nelson said. The Starfish team is developing tip sheets for faculty, staff and advisors and have already gathered online tutorials and user manuals on their website. They will continue to speak directly to advisors, chairs and deans to extend campus wide education and communication of Starfish’s benefits. This summer, all students at orientation will receive access to Starfish training. The team is also finding ways to increase the use of Starfish’s “kudos” feature by 10 percent every year, in which faculty can recognize a student for doing great work. From spring 2017 to spring 2018, the number of kudos given increased by an incredible 87 percent. With a growing list of student-retaining functions like kudos, text alerts and a new “request help” option, Nelson knows Starfish will continue to gain support.